As we’ve mentioned on previous occasions, there are many ways to collect resources in Guns of Glory. 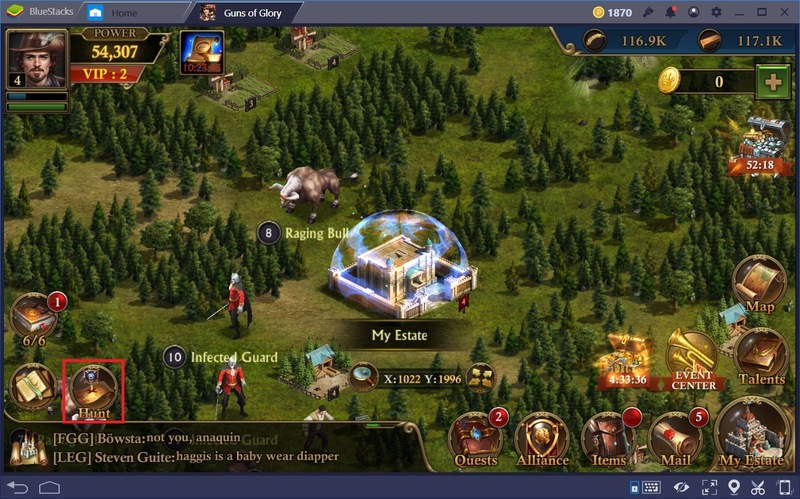 By upgrading resource-gathering buildings, constructing many instances of said structures, sending your troops to gather, and defeating hostile beasts on the map, you will obtain enough resources to sustain your base, and then some. Attacking Red Guard camps is one of such methods, which allows you to team up with your allies in bringing the fight to these creatures, ransacking their camps, and taking all the spoils to be divided among those who participated in the assault. In this sense, Red Guard Camps are this game’s version of high-level player-versus-environment (PvE) gameplay, as players have to be prepared and raise massive armies in order to properly dive into the fray against these beasties. Nevertheless, the rewards are more than worth the hassle, as they grant generous amounts of XP, crafting materials, and resources, all of which can be used to strengthen your lord, your airship, and your estate, in general. However, attacking a Red Guard camp is not as straightforward as going to battle against a regular beast on the world map. In this guide, you’ll find everything you need to know in order to raid these camps and reap the rewards within. First thing’s first; before attacking a Red Guard camp, you must actually find one on the world map. You can do so by scouring manually until you come up to one of such structures. 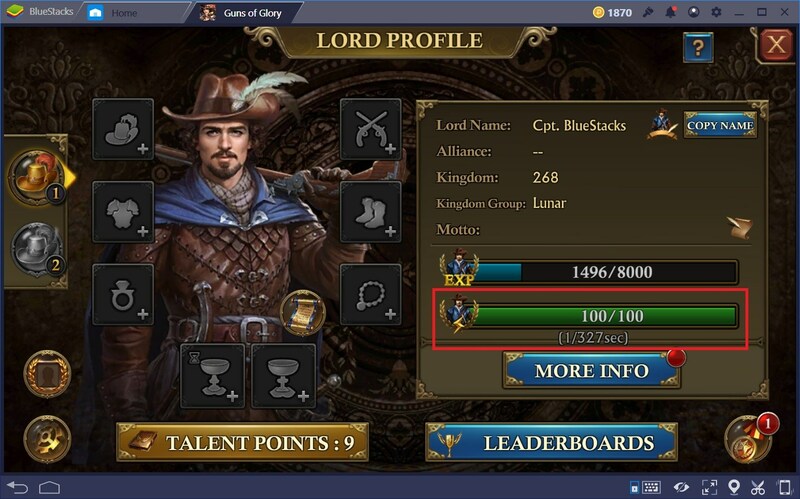 Upon clicking on the camp, you may select “attack” from the menu, which will bring up a list of opponents that must choose to engage in battle. After you choose your opponent, your rally will begin. At this time, you must wait for one or more alliance members to join your rally before starting the march towards the camp. Keep in mind that starting a rally costs 20 stamina points. If you don’t feel like searching manually, you can also search for Red Guard camps by using the “hunt” feature in your world map, which automatically finds and centers the camera on the nearest building of your choosing. Now, once you’ve found a camp, and chosen an opponent, you need to send roughly as many troops as the enemy has in order to stand a chance. If you have combat boosts active, you could get away with sending fewer troops and still come out on top. 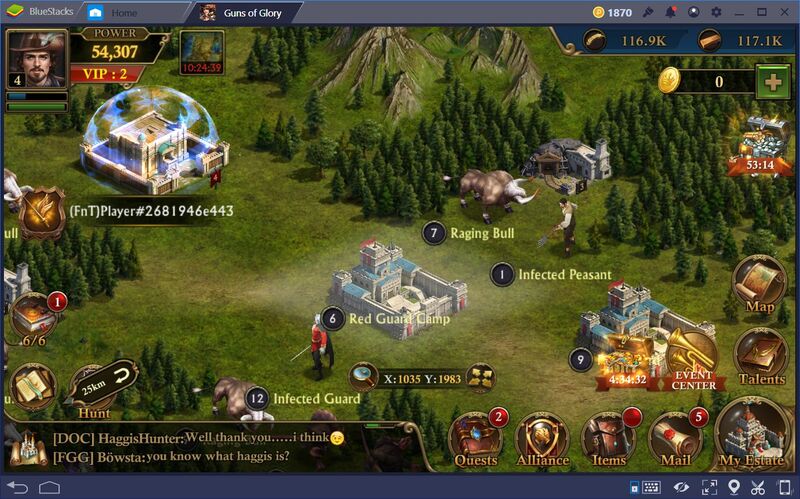 However, to be safe, always try to outnumber your foe in both manpower and in the level of your troops. 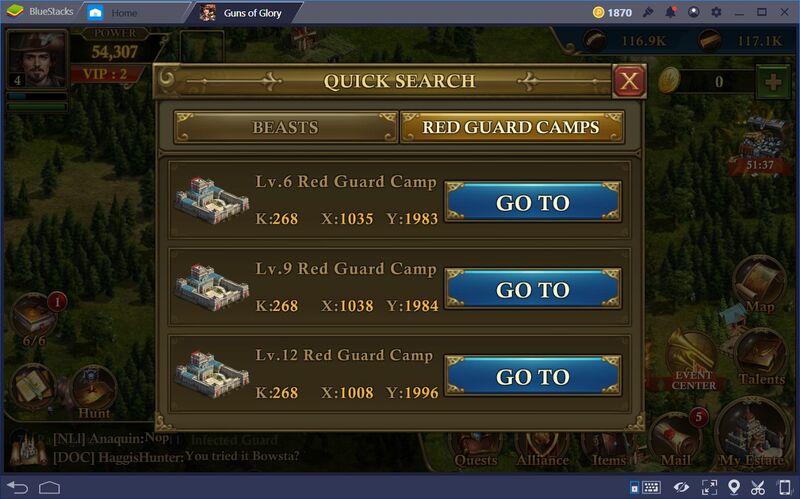 Red Guard camps come in many levels, each in succession of 3 (i.e. lvl 15, 18, 21, 24, 27, and 30). When you click on any of these camps, you might find enemies within the structure’s level. For example, in a level 18 Red Guard camp, you might find enemies between the levels of 16 to 20, which gives a bit of leeway in case you’re not as strong as you’d want to be at the moment. Furthermore, each opponent may fall into different categories, such as cavalry, distance, master, etc. Each type has different predominant troops. Cavalry opponents, for example, have a higher number of mounted units, while distance enemies have more ranged units, and so on. Use this information to your advantage by bringing appropriate troops to counter the foe’s weakness. Damage Loot: This loot usually consists of resource packs, and is determined by the amount of damage that your units caused to the enemy. For camps level 12 and lower, these resource packs are capped at 100k resources divided between all contributors. For camps lvl 13 to 18, the loot is capped at 200k resources. For camps level 19 to 24, the resource rewards are capped at 300k. For camps level 25 and beyond, the resources are capped at 400k. Victory Loot: This is a static reward given to all contributors, regardless of the damage they caused. It usually consists of food packs, as well as seasonal or event items, if there are any of those going on at the moment. Bonus Loot: These camps also drop certain chests, which can only be opened with red guard keys. If any of the players who participated in the assault has a key, they may use it to receive additional rewards. These prizes change depending on the level of the camp in question and may contain Lord XP, Airship XP, crafting materials, and other useful items. 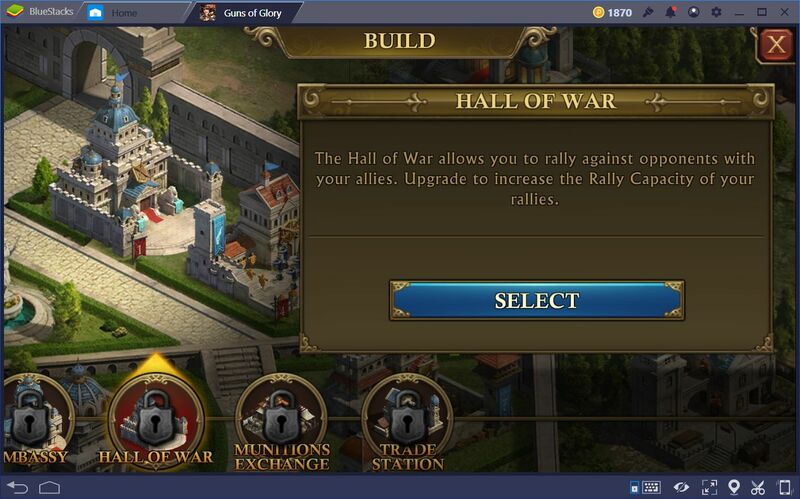 If you’re looking to host a raid on a Red Guard camp, you have to ensure that your Hall of War is at its highest possible level, as this building will determine the number of troops that can join each rally. 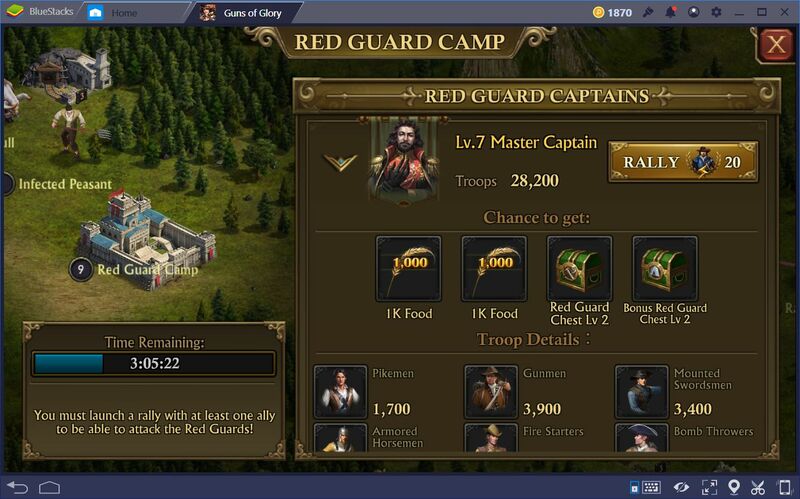 Furthermore, each Red Guard camp has a specific timer and will disappear after it is up. Luckily, if the camp disappears before your troops have arrived at their destination, you and your allies will get their stamina refunded. When it comes to these battles, securing a victory is not always simple. Fortunately, if you happen to lose a raid on a Red Guard camp, you will get your stamina back. However, you might suffer a few wounded units as a result, which can be quickly healed as long as you have sufficient space in your hospitals. Keep in mind that, after you have defeated every single opponent in a Red Guard camp, the structure will disappear from the world map, so don’t be alarmed if this happens. In this sense, if you’re closest to the target, make sure to give your alliance members some time to get organized and march towards the target. This is all you need to know in order to take the battle to your enemies, as well as to reap the sweet, sweet rewards contained within Red Guard camps. If you have any other questions about these types of engagements or would like to share some tips with our readers, feel free to leave a comment in the section below.